Cabel beach in Broom in Western Australia extends up to 23 km/14 miles long. “Cabel” it can be strange name for the beach, but it was given in honour of telegraph cable which reaches Australia from Java on this beach. Riding camel during sunset is one most excited experiences on the beach and of course it is wonderful opportunity for photographers to take some nice pictures. Wow! Looks like a mirage. Riding camels on the beach… just wow! I’ve heard Broome is an interesting place and now it (and all of Western Australia, really) just shot way up on my travel list! Camels were imported to Australia about 200 hundred years ago and were used for transportation, but now they are more like pests. Beautiful photo! I love the reflections. What a sight! 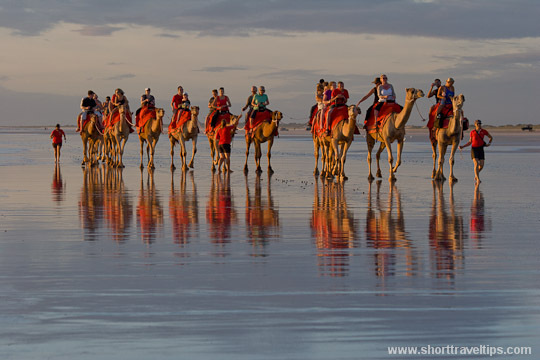 It looks like a very touristy thing to do but camel riding on a beach will certainly be very memorable. Amazing pic! I agree with Sophie! It seems a mirage, definitely! Thanks for sharing! !